Like a poor man’s About Schmidt, but not bad for what it is. Everybody’s Fine is about an aging father whose wife dies and kids all cancel on him when he tries to stage a family reunion a couple months down the line. Not the kind to take a one-man family reunion sitting down, he packs his bags, gets a bonus stash of meds and heads out on a cross-country vacation to make surprise visits to all his estranged kids across the U.S. of A. Back in the Winter of ’09 when this was first being promoted, everything from the poorly photoshopped poster (who is holding that camera and what is up with DeNiro’s face?) to the schmaltzy trailer gave me the impression that I knew exactly what I was setting myself up for. Chances are that I’m not the only one in this boat because as long as there’s Christmas there will always be feel-good fluff for the whole family following suit, but strangely enough, this is nothing like what I expected it to be. This is not a Christmas movie, not in the least, in fact, it’s actually quite the downer of a trip as it quickly strays veers from “Oh, Harold, isn’t this nice?” to “Harold, I’m clean out of tissues and we need to call our kids NOW before they get hooked on crack in Mexico!” And while it’s not quite on par with walking into From Dusk Till Dawn expecting a crime thriller and then wondering where the hell all these vampires came from, it’s a bit surprising all the same. Nonetheless, it’s a welcome change from sitting through two hours of the same crap we get every damn holiday season. For the most part, Everybody’s Fine is a quiet, simple movie about a father trying to reconnect with his kids while figuring out where he went wrong in the parenting department along the way. Nothing crazy, but it does the trick for what it’s trying to achieve. Decent, relatable characters, a sad family dynamic made up of children who make a habit of lying to their father’s face and just when you think there’s gonna be a breakthrough of sorts, the cycle of disappointment continues yet again. I don’t know, there’s not a whole lot to say about the story because there’s only so much that goes on and only so many things to be gained from it, but like I said, it throws you for a loop early on and makes the plot somewhat upredictable as a result, so that’s good. Just not a very funny movie even when it tries to be, it contrasts a little too sharply from super subtle to super heavy for its own good and some of the plot devices are pretty suspect despite how unique they may be. On that note, there were two questionable scenes in particular stuck out for me. The first involves DeNiro’s health being jeopardized after he realizes the hard way why you don’t give money to junkies at the train station and the other is how he confronts his kids about their lying tendencies during a near-death experience instead of just having them fess up in real life. Felt like a strange direction to take the plot in, could have been a lot more effective than they ended up being. And as far as the acting goes, it’s good, but there’s no real opportunity for anyone involved to shine. DeNiro’s good as the father, and his kids are played by Drew Barrymore, Kate Beckinsale and Sam Rockwell who all do a good job, too. Yeah, that’s it. 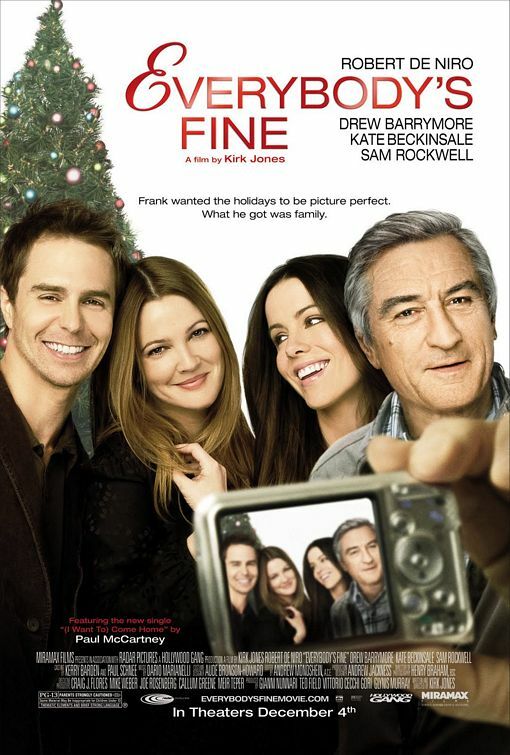 Everybody’s Fine might be right up there with Brothers for having the most misleading ad campaign of 2009, and even though I’m glad it wasn’t what I expected, it’s still…fine. Wouldn’t exactly recommend it to anyone, but if someone forces you to watch it next December, don’t panic, buddy, you’re gonna be okay. Look like it had the About Schmidt treatment, but De Niro can only do so much with a script that seems lame from the get-go. Glad to see it was at least OK though. You said it, man. Nothing special really, but DeNiro did the best he could possibly do with the material at hand. I really wish the 70’s and 80’s Martin Scorsese’s De Niro would come back into acting instead of making worthless movies like this. He can act, I just don’t know about his selections. I don’t even think DeNiro knows about his selections. I’d like to see Travis Bickle/Mean Streets DeNiro come back. This stuff here is definitely below him. As you say, this stuff is completely beneath De Niro. I didn’t check this one out, as prefer to remember him in some of his better roles! Not a bad call. Not missing much to begin with. poor man‘s “about schmidt”. my thoughts exactly. I thought this film had some excellent moments. I wrote a review a few months ago. I enjoyed the idea that the product which the main character made all his life, a product that he is proud of, one that connects people. It is the same product that is killing him, it is the same product he rarely used himself. There are some problems with the film, but I certainly saw the higher concept. But I don’t disagree with some of the “About Schmidt” comments. That was a good element to the story, but it still wasn’t enough to set it apart. Needed some Kathy Bates action if you ask me. Thanks for visiting, man.